Tablets make great consumption devices for video, books, magazines, and pictures, but they’re also good for productivity with a little help. A Bluetooth keyboard is a must if you want to get some work done that involves a lot of typing – just know that not all keys are made equal. 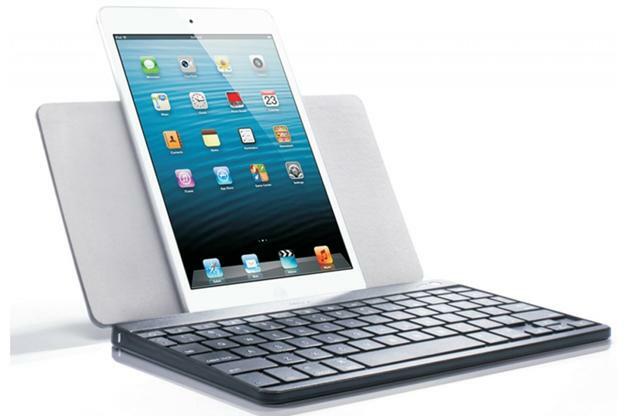 Standalone keyboards aren’t bound by the size of a specific tablet and thus are more versatile. For instance, the iWalk Executive Bluetooth keyboard ($60) works just as well with iOS as it does with Android tablets and smartphones. We like that it’s light and thin while still offering decent tactile feedback, key travel, and key size. No oddly placed or smushed-together keys here. The Executive’s cover is also the tablet/phone stand and keeps the device close so you don’t have to reach far for taps. The kickstand allows for a few different angles, though the range isn’t wide. For something so light it lasts a long time on one charge. Even though the faux-leather look isn’t as classy as the MiniSuit for the Nexus 7, the overall aesthetics are above average for Bluetooth keyboards in this price range. To protect both the front and back of the iPad you need a folio case, and Zagg makes a great one. 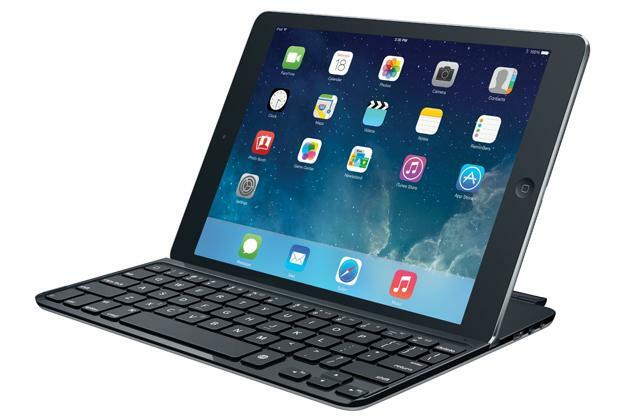 The ZaggKeys Folio for iPad Air and iPad Mini ($74 – $80) has a sturdy back to snap the tablet into and a hinge that allows for multiple positions. 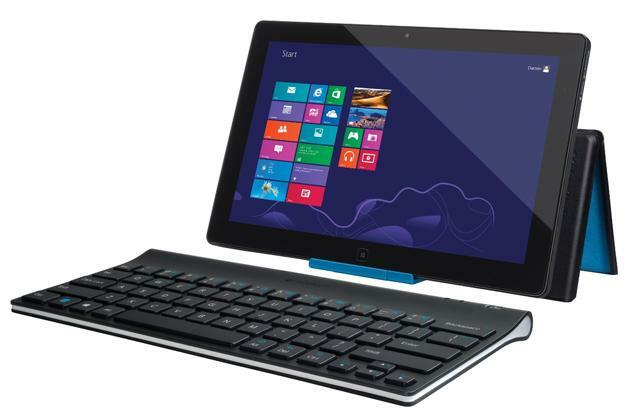 It’s close to a clamshell design but without the bulk and weight associated with Windows 8 keyboard docks. The keys themselves are well-sized with only a few shrunken ones and none in odd/awkward places. They offer good travel for a case so thin and are backlit in blue to boot. We also really like the control key row above the number row that give you one-touch access to media controls, lock screen, even Back and Forward. There’s a similar case for iPad generations 2, 3 and 4 with the same keyboard but a different folio design. Just as with the iPad Mini, keyboard cases and folios for small Android tablets have to compromise on size to fit with the screen size. So you want a case that mitigates this problem the best it can. 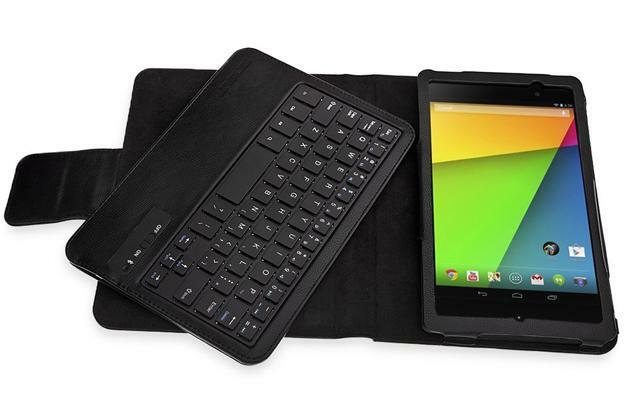 The MiniSuit Keyboard Stand Case for Google Nexus 7 (2013) ($28) offers good balance between size and typing comfort. The keyboard portion of the folio is thick enough that keys have deeper travel than you’ll find on most portable keyboards and a good size battery so you won’t have to charge it as often. It’s not so thick that the case becomes unwieldy. The case itself is made of a leather-like material that looks good and offers moderate protection. Your Nexus will stay snug in the upper pocket whether you’re using it or just carrying around. Bonus: opening and closing the folio turns the screen on and off. 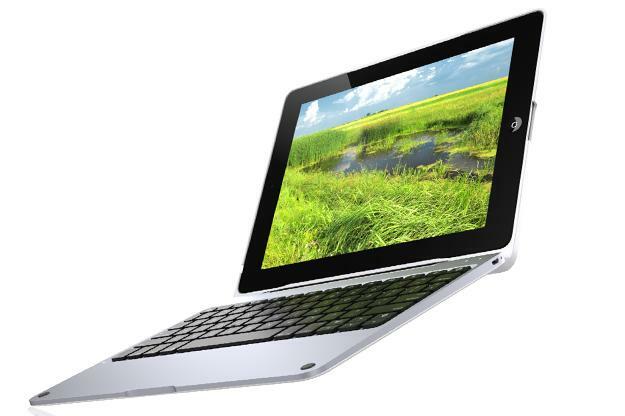 The kickstand on the back only offers one position which is ideal for typing, just not always for watching video. You can fold the keyboard under the tablet for touch-only use, but if you’re going to use it this way for a while it’s still better to slip the tablet out. Logitech’s Ultrathin covers for the iPad and iPad Mini ($75) have always been a big favorite due to the slim and lightweight design and the convenience of attaching it to the tablet on the magnetic edge, just like the Smart Cover. After the iPad Air debuted Logitech made a version for Apple’s newest tablet ($100) that is just as great as previous models. The thinness means that key travel is shallow, though that is not a very big problem when you’re going for ultra portability above all else. Keys are a good size and well spaced on the large versions; even touch typists will be able to get up to speed after a short time getting used to them. The Mini’s keyboard is somewhat cramped due to the size of the tablet. This compromise is necessary if you want a keyboard and cover in one. As a cover, the Ultrathin protects the screen but not the back of the iPad and turns the display on and off. The metal back looks enough like the iPad’s own aluminum finish that they blend aesthetically, keeping things classy even when you’re getting work done. Are you jealous of all those Android and Windows 8 2-in-1 devices that go from tablet to laptop-like clamshell with only a click? Apple hasn’t seen fit to jump on this bandwagon, so you’ll have to turn elsewhere for this functionality. 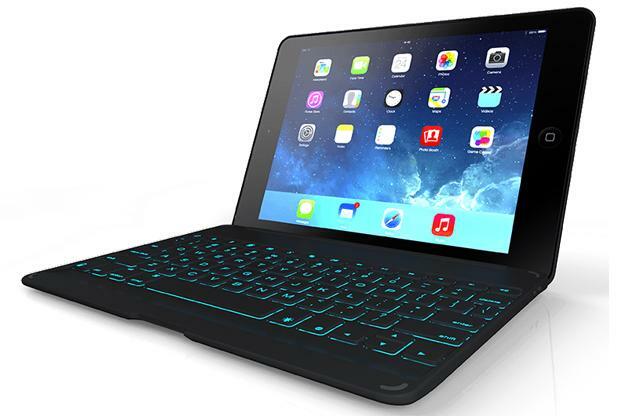 The ClamCase Pro ($170) is such a best – a keyboard case made from aluminum and plastic that turns your iPad or iPad Mini into a laptop-like device (an iPad Air version is coming). The aesthetics here might fool you into thinking it’s an Apple product since the package looks very close to a MacBook Air with the iPad inside. One big difference: the 360 degree hinge makes the whole thing work like the Lenovo Yoga. Fold it back completely for tablet use, or use the base to prop the iPad up for viewing mode. Compared to the iPad alone, the ClamCase is relatively heavy at 3 pounds, though that solidity means it’s tough and durable; an acceptable trade-off. We’re starting to see more Windows 8 tablets that are truly tablets and not part of a 2-in-1 package with a keyboard. That doesn’t mean you won’t still need physical keys (especially considering the annoying Windows on-screen keyboard). Per usual, Logitech has the answer. You might recognize the company’s Tablet Keyboard for Windows and Android ($63) because it’s almost exactly the same as the one made for Android and iPad from a couple of years ago. This model is made to work with Windows 8 and RT plus Android 3.0 and above (including smartphones) and includes special keys like the Start button and media controls. This is not the thinnest or lightest keyboard we’ve used, but if you’re going to do a lot of typing you will appreciate not only the size of the keys but the travel and tactile feedback. The keyboard is light for it’s size and slim enough that it won’t take up too much room in your bag. The cover does double duty as a tablet stand and will hold screen sup to 13 inches.